After working non-stop in Las Vegas, it was time to head back to San Jose. It was so tiring that I didn't even get the chance to hit the tables this time. I guessed it's good in a way since it means more money in the pocket for me. July perhaps. Anyway, we checked out of the hotel and heading for the taxi stand only to be met by a long taxi queue. It was expected since I have to walk by this queue each morning on my way to the market shuttle bus. Like everywhere else in the world, morning peak period means lotsa people and not enough taxis. 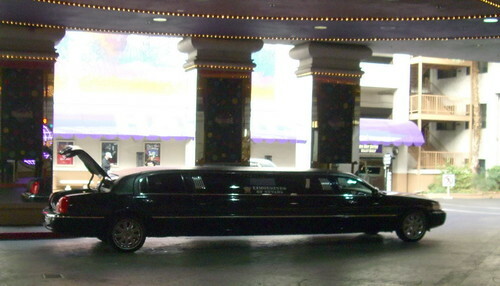 Luckily this Lincoln Limousine pull alongside and the doorman counted the number of us heading to the airport. So a deal was made that for $10 per person, we get to ride to the airport in the Limo. We jumped at the deal as we jumped the taxi queue also. My thoughts on the limo? Well, granted that the seating was comfy and the ride was smooth, it is nevertheless still a bus albeit in the shape of a car i.e. nice to ride in it but not critical enough to want to insist on it. wow.... did you take some pic of the interior of the car? Sunflower: No. I wanted to but too paiseh to take lah. Inside got other people. I wanted to take a picture of the wet bar inside. Glasses, ice, bottles and all. Next time perhaps. Important question....out of the 6 of you in the limo, got chio bu or not?